As you might discern from the above illustration, Sharon Seyfarth Garner isn't just a spiritual director and author, she's a workshop presenter at the SDI Conference Seeking Connection - Across Generations, to be held in Bellevue, Washington, USA March 14-17, 2019. Not surprisingly, she'll be doing a workshop on prayer mandalas. We're grateful she took time to write this piece for us on one of her favorite spiritual practices. Our dog, Bear, loves to go on walks. He’s no longer a puppy, so he is usually pretty mellow as we stroll quietly around the block together. That is, of course, unless we see a … “Squirrel!” Then, all focus is gone and our normally calm Bear is completely distracted and off to the races. My prayer life is full of these “squirrel” moments. I calmly settle into prayer with all the best intentions. However before I know it, distractions take over and my mind is off to the races. Time to be still with God is quickly overrun by “squirrels” that turn my distracted mind toward the grocery list, family calendar, or work deadlines rather than staying focused on God. I am comforted in knowing that I am not alone in my distractibility. We all live in a world full of ever-increasing responsibilities, demands on our time, and 24/7 information overload. No wonder we are distracted! How then, in the midst of this fast pace, can we slow down, focus and savor a few moments together with God on purpose? I would like to share what to some may be a surprising suggestion that has helped me to tame my “squirrel brain.” I have come to cherish the spiritual practice of contemplative coloring. This tangible way to pray has been a powerful, enjoyable and meaningful way for me to enter more deeply into prayer and set some of the many distractions aside. In order to share this discovery with others, I wrote Praying with Mandalas: A Colorful Contemplative Practice (Upper Room Books, 2017) and Mandalas, Candles, and Prayer: A Simply Centered Advent (Upper Room Books, 2017). The response has been beyond anything that I would have expected and I am grateful for God’s presence through it all. Folks are praying with mandalas in prisons, hospitals, hospice, youth groups, churches, retreat centers, around the family dinner table and around the world (including Liberia, Israel, France, Germany, New Zealand and the United States). • The Lectio Divina mandala can be used to pray with a scripture that is particularly pertinent. I might suggest a scripture that I have discerned for my spiritual directee or ask them to select something for them self. • The Intercessory Prayer mandala can help to focus their prayer time on someone who has been particularly present on their heart – joys, challenges, healing, grief, celebrations, etc. • The Centering Prayer mandala can be helpful for those who find it particularly challenging to create moments of stillness amidst an especially busy and chaotic schedule. • The Daily Examen mandala can help folks to better have eyes to see God’s presence in the stuff of everyday life. I love those spiritual “ah-ha” moments when folks realize that prayer can be experienced in all sorts of unexpected, creative, new ways. I invite you to draw closer to God by putting a crayon in your hand. May we all learn to tame our “squirrel brain” distractions and center our selves in God’s unconditional love and abiding presence. Rev. 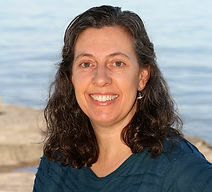 Sharon Seyfarth Garner , Director & Founder of Belly of the Whale Spiritual Direction & Retreat Ministries, is a United Methodist pastor (ordained in 1997), certified spiritual director (Ignatian Spirituality Institute), retreat leader and author. Her books Praying with Mandalas: A Colorful, Contemplative Practice and Mandalas, Candles and Prayer: A Simply Centered Advent have introduced thousands to the spiritual practice of contemplative coloring. Sharon shares her passion for prayerful coloring through her spiritual direction practice, a six-session eCourse (Upper Room Books), as guest contributor to the My Quiet Spaces website, in women’s prison ministry, and retreats/workshops worldwide.